The second collection of Digger is here, featuring the third and fourth chapters of the highly acclaimed webcomic. Digger is still lost in the strange land she discovered at the end of a one-way tunnel, which now seems more intentional than accidental. A seemingly innocuous fossil she picked up on the way is suspected of having more to it than meets the eye, and the beneficient talking statue of Ganesh has a need that sends Digger and a decidedly unhinged acolyte deep underground in search of answers. 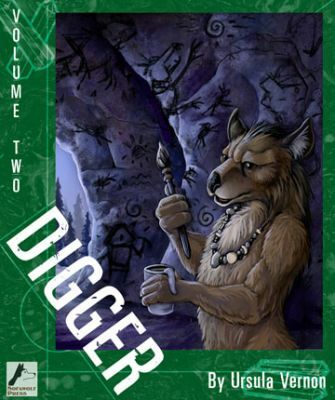 Digger Volume Two continues the story which is attracting so much attention. The New York Times calls Digger "...A visually powerful strip. ", and Ping Teo ("The Jaded") says "Everyone's been rhapsodizing about it, and with good reason.". This collection also contains a short bonus section written and illustrated by Ursula, describing the domesticated species of moles favored by wombat society in the pursuit of their digging. Winner of the Web Cartoonists' Choice Awards in the categories of Outstanding Black and White Art (2005, 2006) & Outstanding Anthropomorphic Comic (2006), Digger has also attracted the attention of the wider comics industry — garnering Ursula Vernon a 2006 Will Eisner Comics Industry Awards nomination in the category of Talent Deserving of Wider Recognition.